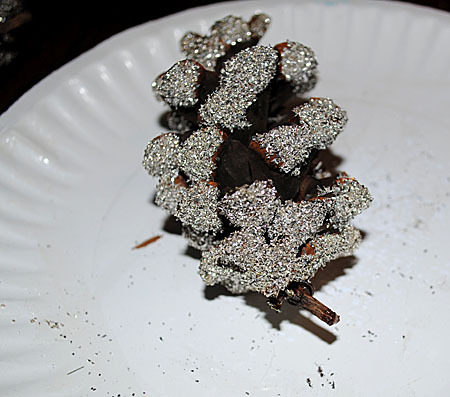 Several people have asked me to post a Tutorial on the Glitter Pine Cones that I made this year. I was inspired to make these after seeing the ones that my friend Marian made to sell at Lucketts Store, although mine are a wee bit different. I’m sliding this one in practically moments before Christmas Day! 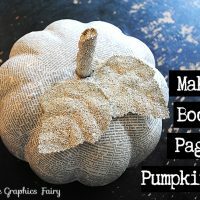 A little late I know, but you can always Pin this to Pinterest and make them next year! 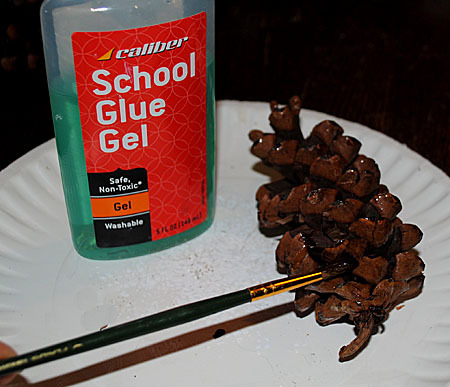 Step 1) Apply the School Glue Gel using a Small Paintbrush, just to the outer tips of the Pine Cone. 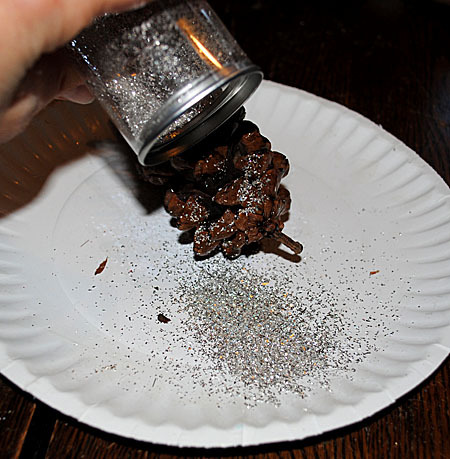 Step 2) Sprinkle on the Silver Glitter. ( I usually work on about 1/3 of the cone at a time, glueing and glittering each third, and then moving on to the next section.) 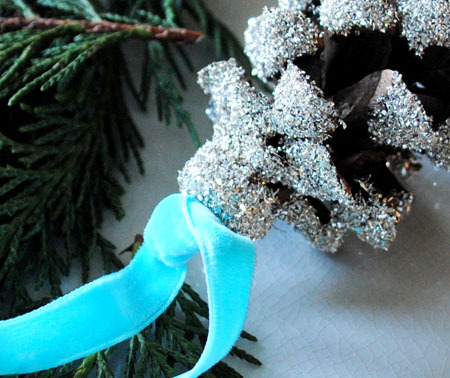 Shake off any excess glitter and allow to dry. Step 3) This is another step that you can probably skip if you purchased your cones. If you found them in nature though, they may have a little stem, like you see on mine in the photo above. You just want to snap that stem off with your fingers. 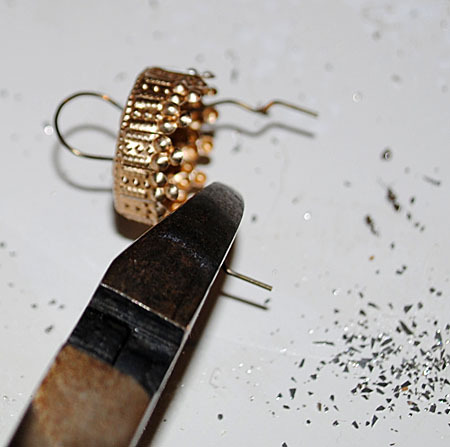 Step 4) Take your metal ornament cap, and cut off the excess wire, with wire cutters. You want to keep the metal loop, so just cut the wire part so that it matches up with the edge of the cap. 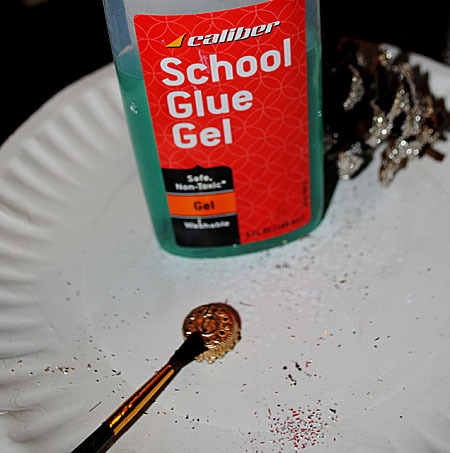 Step 5) Apply more of the School Glue Gel to the Ornament Cap. 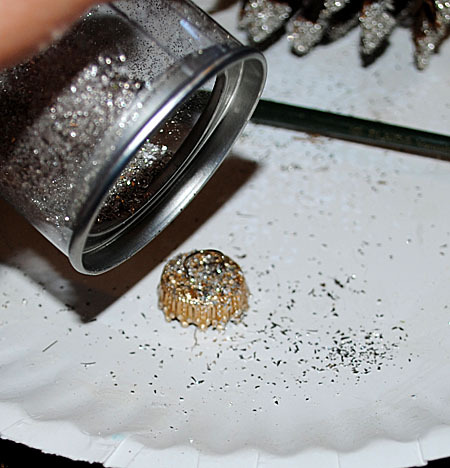 Step 6) Sprinkle on Glitter to cover it and allow to dry. 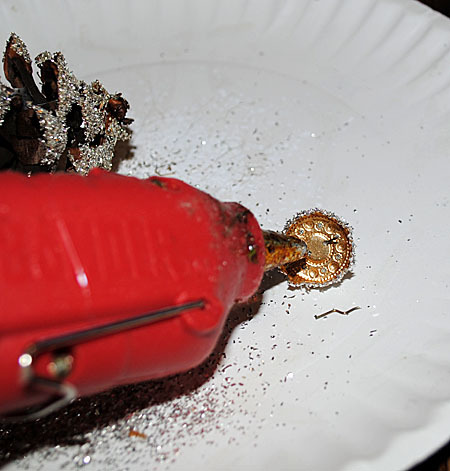 Step 7) Fill the cap with Hot Glue and apply to the end of the Pine Cone. 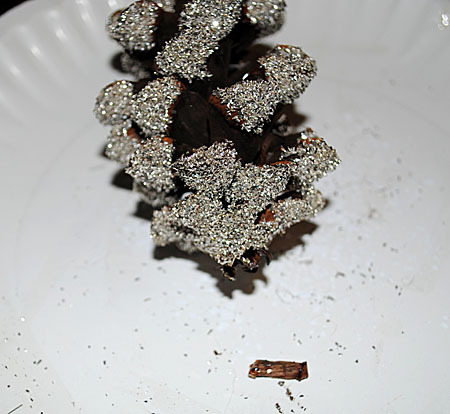 Step 8) See how nicely the cap blends in with the glitter on the Pine Cone now?! 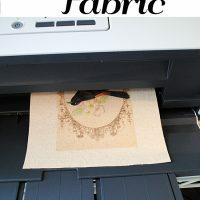 Then just add a pretty Ribbon or you can use a wire hook if you prefer. 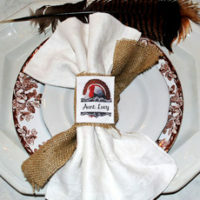 or you can display them in bowls, or on a pretty package, or use them however you like! 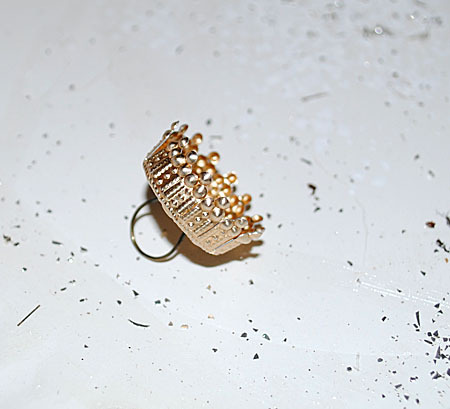 These are really lovely, thanks for sharing the tutorial on how you made them. 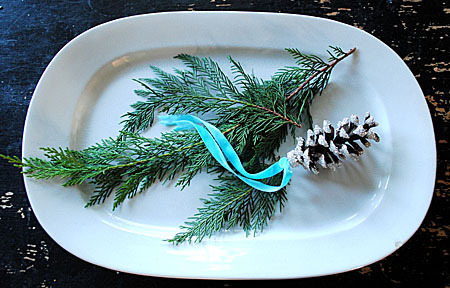 I missed the pinecones this year thanks to hurricane Sandy, but I will pin this for next year. 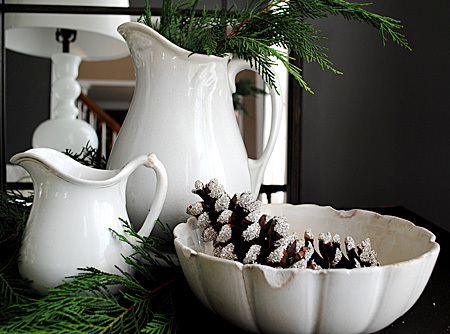 Merry Christmas and thank you for all you do all year and the many crafts, images, etc. . .that you share with all of us. You are a very generous soul.